I decided to include a Companion Print with the Booklet. In the process, I believe I coined the term Companion Print, unless I missed seeing this term used elsewhere in a similar context. The Companion Print is very exclusive and this for several reasons: first, I do not offer prints smaller than 11x14 (matted to 16x20) in my regular collections. Second, if I was to sell the Companion Print separately, the cost would be $40 minimum per Companion print, unmatted. So you are getting an incredible opportunity to collect my work at a very advantageous price. 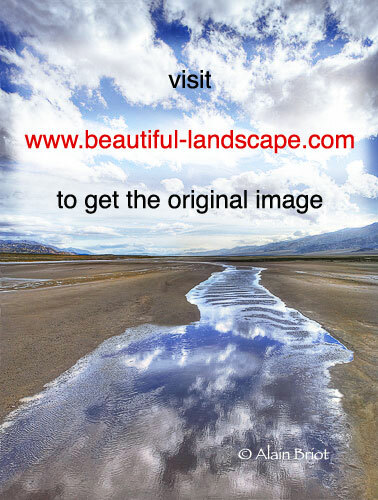 The print is signed under the photograph and can be matted to 11x14 mat size. If you want to receive your Companion Print matted, I am offering custom mats cut for each print size (there is a second companion print offered with the Navajoland DVD, and each Companion Print has a unique size to respect the composition of each image). These mats are hand-signed on the mat, in pencil. This way you have my signature visible after the print is matted, without having to leave a space under the print in the mat so that my signature can show. Plus, the print is ready to display right out of the box, without you having to do anything. 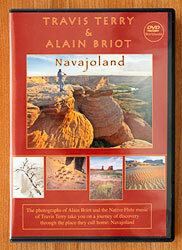 The Navajoland DVD is the companion to the Navajoland Music CD. I planned to announce it in mid-April, and it was a complete coincidence that duplication was completed at the same time as the Death Valley Booklet. Rather than make two separate announcements a few days apart, I decided to announce both at the same time. Again, if you are a photographer the Navajoland DVD is a wonderful example of how you can use your images, this time as a DVD movie with a musical score. Here too, this project was completed using easily obtainable software and in a relatively short time frame. Details of the software used are provided with the DVD. A special offer for 16x20 matted prints of the images featured in the movie is included in the DVD. 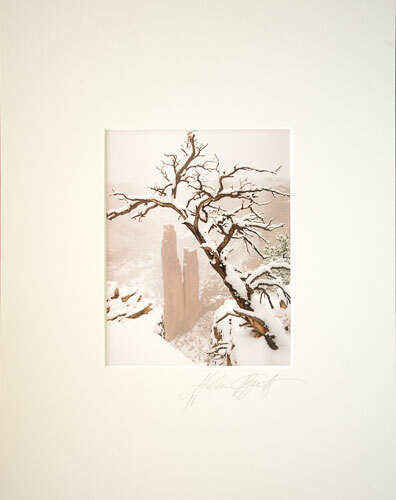 These prints are priced below my Print of the Month prices, and are only available to Navajoland DVD owners. I decided to include a Companion Print with the Navajoland DVD as well. 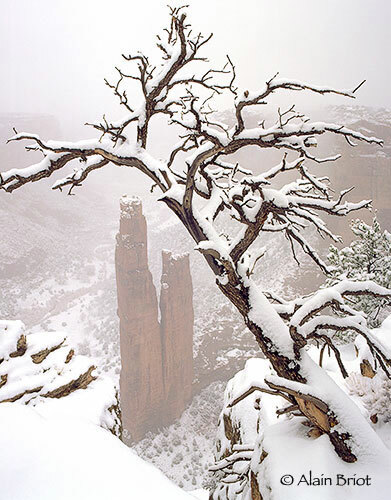 I selected Spiderock Snowstorm for this Companion Print because it is one of the my landmark images from Navajoland. 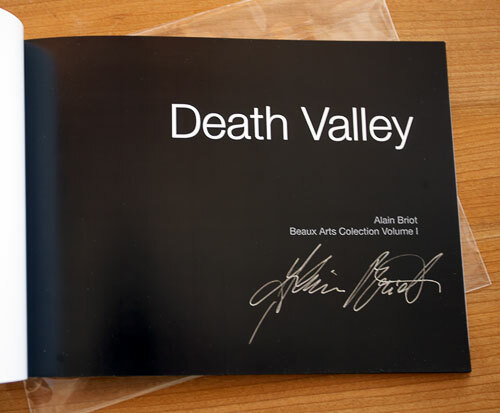 This companion print, just like the two Companion Prints for the Death Valley Booklet, is printed on the Epson 4800 on Crane Museo Silver Rag. The print quality is stunning. 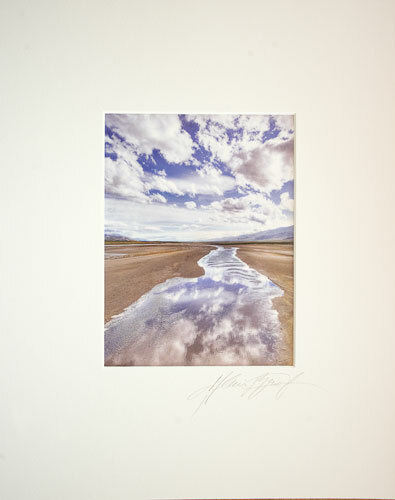 Each companion print is printed to the same exact standards as my regular fine art prints. The only difference is the size. These prints are 5"x7" (exact size varies depending on the composition of the image) instead of 11x14 or larger, tha's all. Matting (if you select the matting option) is Museum Quality, which is the highest matting quality we offer. It's a great offer. Natalie may have me pull it off this site if she finds out about it, so you probably want to take me up on it right away! I hesitated on this one. First, I wasn't sure whether to offer 8"x10" or 11"x14" mat sizes. So, I asked Natalie to mat both prints in both sizes. When I saw the prints matted the choice became evident right away. 8x10 looked like touristic souvenir items. 11x14 looked like fine art. The larger mat border of the 11x14 presentation gave the 5x7 prints plenty of room to "breathe" and exist on their own. In the larger mats the images really stood out in a beautiful and world-class presentation. So we decided on the 11x14 mat size with custom cut openings for both prints since each of them has unique dimensions. The mats are museum-style, our finest quality, meaning they are white 4 ply Bainbridge archival mats, with a backing board hinged to the top mat. Natalie mounts the prints with mylar corners so that the mounting process is 100% reversible. Finally I sign each mat. The result is a stunning, jaw-dropping presentation that will make everyone you show them to envy you. The second aspect of my uncertainty is that I only offer matted prints in 16x20 minimum size normally. Plus, I wasn't sure how to price smaller prints. So I decided to charge $25 extra per matted and mounted print, with shipping. That's a very small amount for a fine art print to say the least. At this price I don't know how many Natalie will agree to make until she "pulls the plug" so to speak. So order quickly as this is truly a tentative offer. Photographs of the actual matted prints. The print and matting quality exceeds what can be shown on the web. The simplest way is to use the Paypal buttons. If we have your credit card on file, just let us know what you want to order by email or phone. If you prefer not to use Paypal, simply email or call:800-949-7983 or 928-252-2466 and alain@beautiful-landscape.com Just make sure not to delay too long since limited quantities are available. To be fair, orders are placed on a first-come first-served basis. Natalie and I appreciate both your interest in our work and your business. Orders shipped to Arizona: add 7.8% sales tax. No sales tax is charged on out of state or international orders.